We have brought two research traditions together to study how perception relates to comprehension in reading. Eye movement research has for a century been used to understand how perception in reading provides the brain with sensory input. Miscue analysis, with over 40 years of history, provides a “window on the reading process” and reveals the knowledge and strategies readers use as they comprehend written texts. 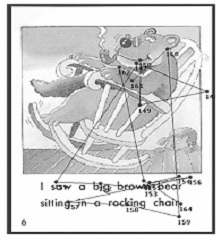 By a close examination of the relationships of the expected and observed responses (miscues) in oral reading we get strong insights into the reader’s process of making sense of written language. We call the merged research methodology Eye Movement Miscue Analysis (EMMA). By tracking eye movements of readers while we record their oral reading, we produce a powerful database for the study of readers’ construction of meaning. The data is both a continuous record of the eye fixations and movements over an entire text and a continuous record of the oral reading of that text and the miscues readers produce.